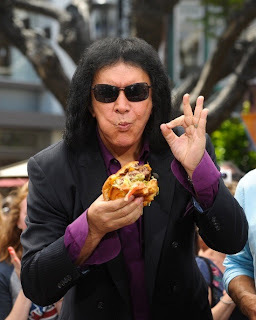 WAILUKU, Hawaii -- A proposed restaurant owned in part by veteran rock 'n' roller Gene Simmons has merchants worried in a small town on the northern coast of Maui. Backers hope to open the newest Rock & Brews restaurant by the end of the year in Paia, a town characterized by its plantation architecture. The eatery "seems kind of startling in Paia," Rose Potter, executive director of the Paia Merchants Association, told the Maui News (http://bit.ly/16eFo9z ). Partners in the restaurant and bar said it will not be blasting the music of Simmons' band Kiss but will instead be a family friendly establishment that blends in with the community. Three other restaurants owned by the group have a playground and bench seating for families, said Rock & Brews founding partner Michael Zislis. He said the newest one in Paia also will be a place where parents can grab a beer while taking their kids for a meal. "This is not going to be a 'cookie-cutter' restaurant from the mainland and forced into Paia," said project manager Bill Frampton of Maui-based Frampton & Ward LLC. He noted that the design has been modified by Maui architects and a Hawaiian artist to blend in. And because Paia has a shortage of restrooms, the restaurant will have more than the required number and anyone will be allowed to use the facilities, Zislis said. County Department of Planning Director Will Spence acknowledged that the project's design has been changed to fit in with the town's existing architecture. Building and other permits are still needed, he said. Other Rock & Brews restaurants have been opened in Redondo Beach and El Segundo, Calif., and San Jose Del Cabo, Mexico.